Starts as small red bumps. These change quickly to cloudy blisters or pimples. Then, they become open sores which drain fluid or pus. Any sore or wound that grows and doesn't heal is usually impetigo. A skin infection caused by a bacteria. It starts in a small break in the skin. Examples are a scratch or insect bite. The most common bacteria are Staph and Strep. If the child has a sore throat, they may also have Strep throat. A rapid Strep test will give the answer. 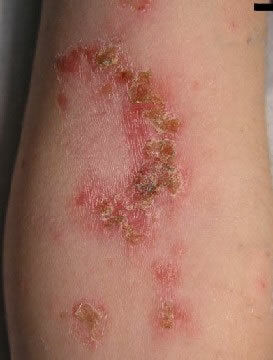 Impetigo often spreads and increases in number from scratching. Child plays contact sports. Reason: to prevent spread. 3 or more impetigo sores. Reason: may need an oral antibiotic. Many of these children also have a Strep throat. Impetigo is a skin infection. Most often, it starts in a scratch or insect bite. It usually responds to treatment with any antibiotic ointment. Soak off the scab using soap and warm water. The bacteria live underneath the scab. Put an antibiotic ointment (such as Polysporin) on the sores. No prescription is needed. You can also use one you already have. Cover it with a bandage (such as Band-Aid) to prevent scratching and spread. Repeat the washing, ointment and dressing 3 times per day. Help your child not to scratch and pick at the sores. This spreads the impetigo. 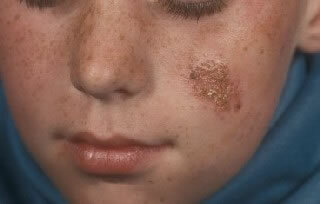 Impetigo is spread to others by contact with skin lesions. Wash the hands often. Try not to touch the sores. For mild impetigo (1 or 2 sores), can go to school if it is covered. For severe impetigo, child needs to take an oral antibiotic for more than 24 hours. Then your child can go back to school. Contact Sports. In general, needs to be on antibiotics for 3 days before returning to sports. There must be no pus or drainage. Check with the team's trainer if there is one. Sore stops growing in 1 to 2 days. The skin is healed in 1 week. This photograph shows the typical appearance of impetigo. Impetigo is Often covered by a soft, yellow-brown scab or crust.